Last week I blogged about bladder weakness and the new TENA Lady Discreet range, which can really help if you’re one of the many millions of women suffering from bladder weakness yet want to have an active lifestyle. Like most of you, I’m aware that pelvic floor exercises are a Good Thing, but don’t feel qualified to advise on the medical side of things. That’s why I’ve brought an expert in to help – none other than Dr Hilary Jones, who you might know from ITV’s breakfast programme. I asked him about bladder weakness and what women can do about it. Sporty over Forty: The readers of my blog are mostly women over 40 who work out (or are just starting on an exercise regime). Many of them suffer from bladder weakness, particularly after having had children. Is it too late for them to address this issue? Should they choose their sport accordingly or can they do anything to improve the weakness? Dr Hilary: Bladder weakness is very common, especially after childbirth, and can be particularly problematic when enjoying physical activity and sport. In a recent survey of 101 women, 48 women experienced bladder weakness in daily life but 32 only suffered from it when playing sport. The other 21 experienced it in both scenarios. 25% had it whilst jumping, 15% whilst doing abdominal exercises, and 8% when jogging. This reflects the effects of gravity and abdominal pressure so the type of exercise is definitely relevant. Continuing to breathe throughout the exercise and not straining is important. But bladder weakness should never put women off enjoying sport – indeed it will help. It is never too late to start doing those pelvic floor muscle exercises which should be practised regularly on a daily basis in addition to formal exercise. Significant results can be obtained within a few weeks or months and this is doubly so if bodyweight is normalised through regular training. Sporty over Forty: If a woman over 40 is suffering from mild bladder weakness, what steps would you recommend she take to address it? Dr Hilary: Many women in their forties find they have more time to enjoy physical exercise and this is important as it improves their quality of life. With age, however, there is some natural loss of collagen; the supporting material around the pelvic floor which helps to support the bladder. So, pelvic floor exercises should be practised frequently. For day-to-day management of bladder weakness I would recommend the TENA Lady Discreet range of pads. Thanks to microPROTEX™ technology, they are 20% thinner, yet just as secure and offer triple protection against leaks, odour and moisture for complete comfort, security and reassurance. Sporty over Forty: What about if her bladder weakness is more severe? Dr Hilary: When pelvic floor exercises have been carried out correctly but symptoms persist, I would encourage any woman to go and talk to their GP for an examination. If necessary, a referral will be made to a therapist who specialises in Kegel exercises, or to a gynaecologist who can carry out urodynamic studies. There are a number of non-invasive or surgical procedures that can remedy the problem and vastly improve the quality of a woman’s life. Sporty over Forty: Is there anything else that women over 40 doing exercise ought to know about the subject of bladder weakness? 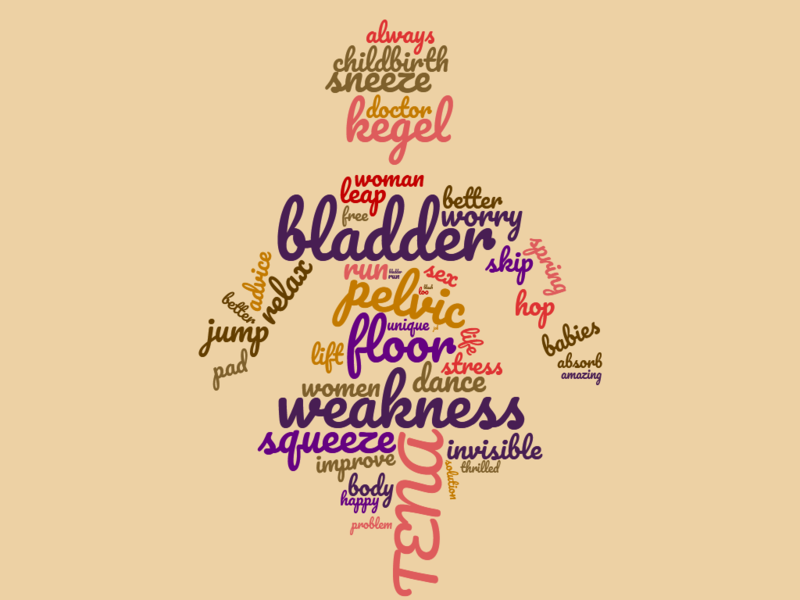 Dr Hilary: No woman should feel alone with bladder weakness, as it is a common occurrence for many and affects up to half of UK women at some point in their lives, but of course few people like to talk about it. No one should suffer in silence as thanks to TENA Lady, there are a wide range of offer products and solutions on hand for women which can make living a life without any limitations perfectly possible. So there you have it. No excuses for couch potato behaviour! And sque-e-e-e-e-e-e-e-e-z-e. Note: I have received no payment for this post.